I started this route just above the lovely village of Vivario but just below the Le Chalet cafe on the T20 (N193). You're only on the N road for a little while at the start and again at the end of this route which is an anti clockwise loop. It takes in the Cols Sorba, Cardo, d' Erbajo and Morello as well as the rather intriguingly named, Défilés des Strette and de L'Inzecca. At the Chalet cafe resist the urge to stop and turn left onto the D69 and ride up to the Col Sorba which is just over 7km ahead. The road gradually gets steeper and once you're on the switchbacks it's plus 7% for around 3km (max 13% for 0.5km just below the Col). 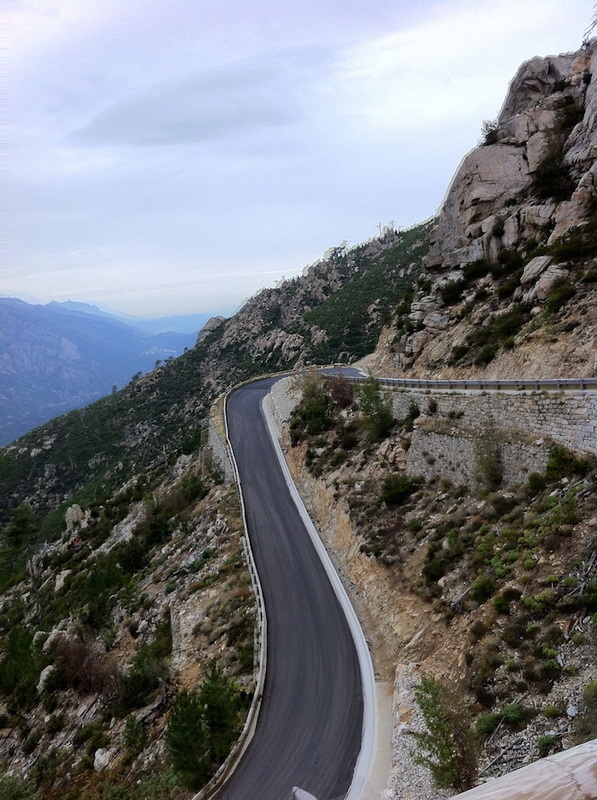 The road surface is a freshly laid ribbon of super smooth tarmac and a joy to ascend (or descend!). Sorba is the highpoint of the day and is followed by a sweeping 11km descent through the forest to Ghisoni where you just have to pause to get the obligatory photo of the magnificent Neptune fountain (no you're not by the sea). The descent continues for a further 11km, now on the D344, tracking the Sampolo river and three small lakes. First it's through the Défilé des Strette where there's some amazing rock architecture on display. After the third lake, the Sampolo reservoir, there is an unlit tunnel of around 250m in length where care is required in case of any other traffic. Leaving the tunnel is the entry to the Défilé de L'Inzecca, a spectacular narrow river gorge with house sized boulders in the river below. After a couple more kms you will have been descending for 22km since Sorba - it's now time to head back on the D343a so watch out or the sign on your left. It's a few kms to the Col de Cardo and then go left onto the D343. It's a 16km ride now to the Col d'Erbajo at an average of 4%. Watch out for pigs in the road and at Vezzani there's a lovely 'Three Graces' water fountain before pushing on up (0.5km at 12%) to the Erbajo a couple of kms away and then another 5km to the Col de Morello. From the Morello a welcome descent lures you to the sting in the tail! After the village of Muracciole you'll be just a few kms from your start point however those final kms average 6% with two 100m stretches at around 20% just to give those legs a final test before refreshments at Le Chalet or down in Vivario. This final section featured in stage 2 of the 2013 Tour de France.